Ceramic knives are the mainstay of any kitchen or cheffing environment, providing a really easy, simple solution to cutting food quickly. But which knife would you want if you were to choose? It is so tough to navigate the vast range of choices out there. Well, this is why we’re here. Make sure you check out the below list that we’ve identified as the best ceramic knives on the market today. 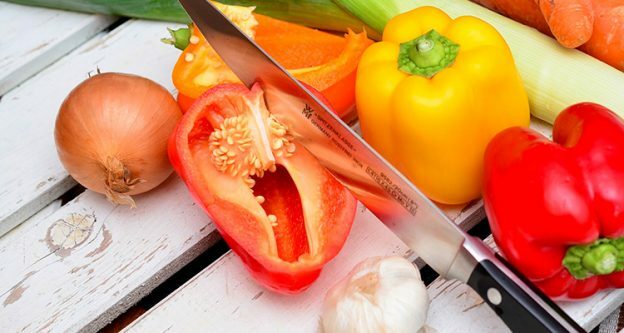 There’s a number of beautiful, practical solutions to your needs within the kitchen, and here is to hoping that you find the best ceramic knife for you. This 3 piece knife set gives you a great range of uses for a really reasonable price, including 6-inch, 5-inch and 3-inch knives which will help you whilst cooking a real variety of foods. Offering what Kyocera call “superior edge retention” these knives promise to be hard working, sharp and tough throughout their whole lifespan in your kitchen. Which, by the way, should be a long, long time. With this set of blades comes a lifetime warranty to protect against and chips or breakages, and it’s this point that I find it hard to look much further when identifying a set of the best ceramic knives on the market. What an incredibly beautiful piece of kit this is. Practical, sharp and also excellently styled, this product from the LauKingdom range is as visually pleasing as it is practically brilliant. Boasting a nice and long 8 inch blade, and designed to match the traditional Damascus steel making style, the method behind the blade definitely matches the way it looks. With a wooden handle and stainless steel blade, this knife may sound like any other knife on the market, but the layers of steel in the blade is unusually high for the industry. 67 layers and opposed to 33 means that when you’re using the knife you will get an increased, more accurate sharpness and cut. This set of ceramic steel forged knives is brilliant value for money because you’re getting more for it. A 6 piece knife set that has great reviews and all pieces use really well for all different kind of cuts. The largest knife starts at 8 inches with the smallest coming in at 3.5 inches, these will be perfect for your home cooking space. Meat, vegetables and fruits will be no match for this knife set. The design on this set of knives is more classic than our first choice, which is actually something I really like. No matter the style of your kitchen, the traditional black handle and blade look is timeless. You get a little bonus in this kit: here you’ll be getting the ceramic knife and paired chopping clock too. This dishwasher safe option was designed and built in Germany and that blade is produced through using one single sheet of stainless steel and is incredible sharp. In whole this knife is 7 inches long and really the chopping board is just a nice addition, because the knife is the thing that’s really worth buying. The stainless steel on the knife is ice hardened, which improves its sharpness and its stain resistant elements. If you’re looking for the best ceramic knife with the best value, this is certainly an option. The High Carbon Stainless Steel Chef Knife by Nurish is a really steady, super-stable piece of kit. The blade is great on this knife and is designed with a number of international influences, taking the best from Japanese and German knife-making techniques to get the best from both worlds. The knife is 8 inches from end to end. And if you have a problem with this product, you have peace of mind that upon purchase you get a 5 years warranty against breakages and faults. I’m sure we’ve given you a wide range of options to choose from, from sets to individual knives. Each are slightly different: we wanted to give you a great scope for the market we’re reviewing. Whatever you choose from the above will be a great addition to any kitchen to prepare your favourite recipes, whether you’re a professional or home cook. We’ve given you the links to the products so you’re able to purchase the knife you decide on. All that’s left to say is: happy shopping!